I came across a great recipe challenge recently on Belleau Kitchen. Geared around choosing a recipe at random from your stash of cookbooks (hence called ‘Random Recipes’) it seemed a fab idea. I’ve got a serious cookbook addiction but, like a lot of people, most of the time I cook from half a dozen favourites whilst the rest gather dust. Challenge yourself, I thought. So far, so good. My first problem was the cheesy nature of my blog. I didn’t want to cheat but equally a recipe for Thai-marinated pork thighs or somesuch was going to look a bit out of place (and I wasn’t sure I could get away with just sprinkling a bit of parmesan on the top). 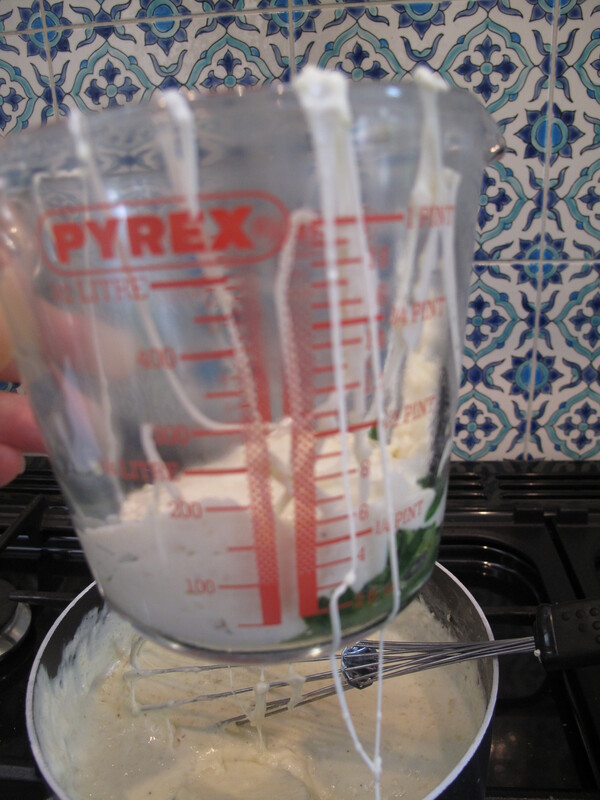 The rules said if I chose a recipe I’d already cooked I could go to the next page, so I thought I’d just keep going until I found a cheesy one (apologies Belleau Kitchen for the complete mangling of your rules). I left out all the obvious non-cheese contenders (sorry Gok Wan) and made my selection and – huzzah! 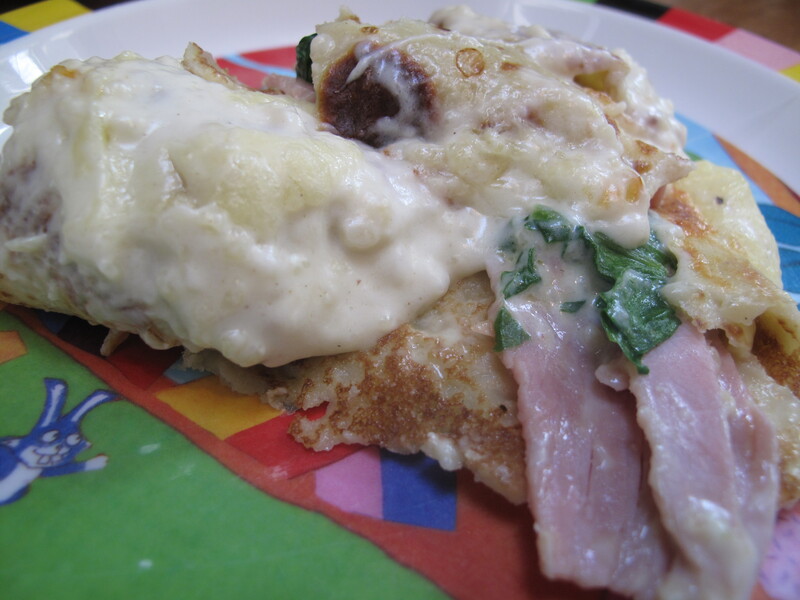 – Rick Stein’s Baked Cheese, Ham and Spinach Pancakes it was! Without a word of a lie, I didn’t even have to cheat. Excellent, I thought. Pancakes are easy but I don’t usually cook savoury ones. I can knock these out in no time and the children will happily wolf them down, imbibing much of their daily requirements of calcium and iron in the process. 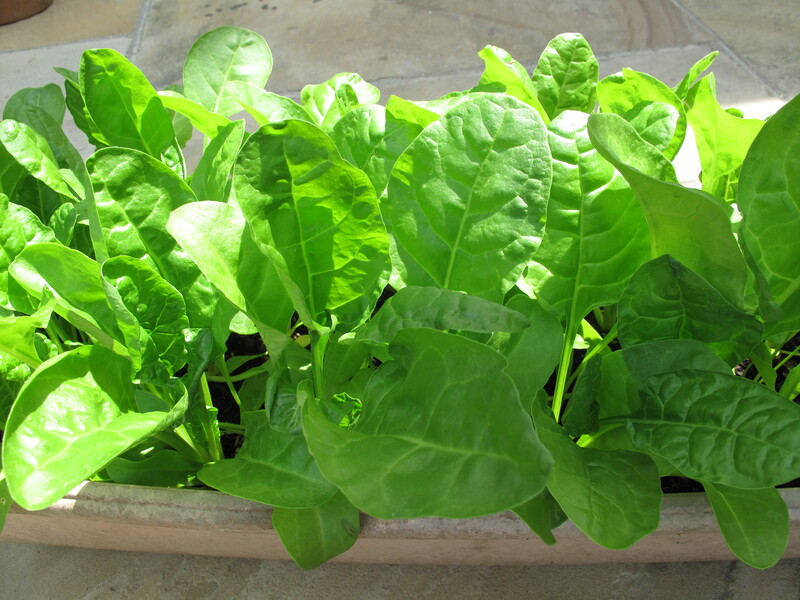 We even had some spinach ready in the garden. Lovely Rick Stein. And so I got to work. I think I may have been humming a bit at this point. I started by making the sauce. I studded the onion with the cloves and put it into a pan with the milk, bay leaves and black peppercorns. I brought it all to the boil and then set it aside to infuse for twenty minutes. Disaster. I scraped it off the floor, figuring that children are too protected from germs these days anyway. Eldest boy, unimpressed, went off to watch the television. The baby started to cry. And then I read the bit where Rick says, ‘Slide onto a plate and repeat to make 12 pancakes.’ TWELVE pancakes?! You’re having a laugh, Rick. I had already used a quarter of the batter to make a not very large pancake (which was currently in bits anyway). There was no way the mixture was going to stretch to twelve unless they were the size of a mouse handkerchief. I was starting to feel hot. I made the executive decision to make four pancakes. Jamie Oliver would approve of this kind of improvisation, I’m sure. And that’s why I usually cook from his books and NOT YOURS, RICK. BOY: I thought we were having pancakes. BOY: Where’s the sugar and lemon? ME: We’re having them with cheese and ham. BOY: But I want sugar and lemon. ME: Well, Rick Stein says we’re having them with cheese and ham. 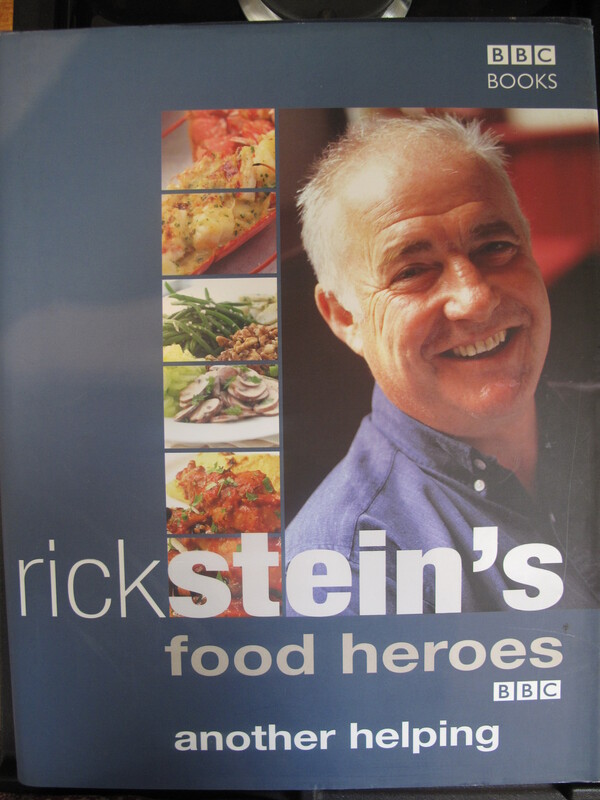 BOY: I hate Rick Stein. He’s a poo-poo head and a Lady Gaga. I was starting to agree with him. I’m supposed to stir a third of the sauce into the spinach but it was like trying to manipulate wool that’s been dipped in glue. The hob was starting to resemble the web of some giant cheese-emitting arachnid. Both children were crying with hunger and I was cursing Rick Stein and whatever no doubt picturesque Cornish fishing schooner he rode in on. 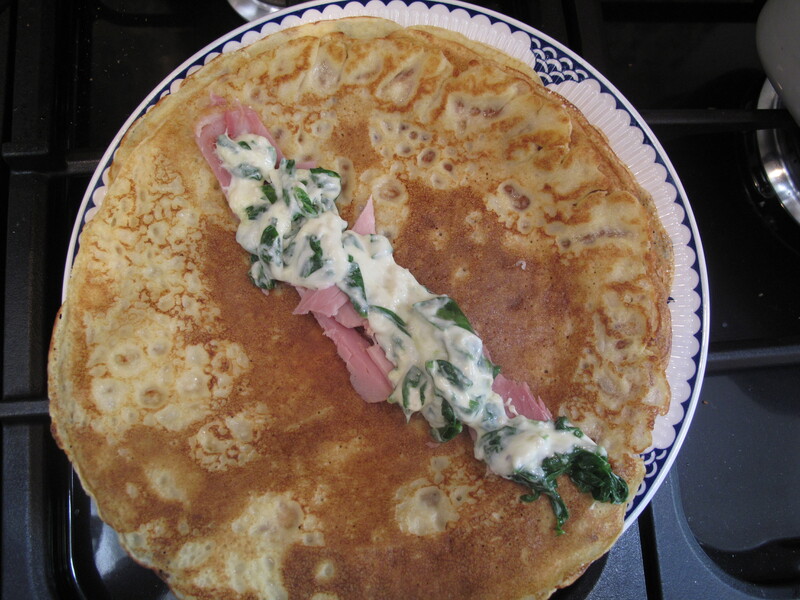 I laid the pancakes out flat and covered the centre of each with some ham and spinach mixture. Mmmm, bet your mouth’s watering, isn’t it? The children ate sullenly, in silence. ‘What do you think?’ I asked eldest boy. He pondered the question. BOY: I like some of it and I don’t like some of it. ME: Which bits do you like? BOY: This bit of pancake [pokes small bit of pancake]. ME: And which bits don’t you like? BOY: The ham, the cheese, the green bits and the pancake with goo on it. Rick Stein, you are officially a poo-poo head and a Lady Gaga. Ha, ha, thanks! I don’t know about ‘fresh and quick’ but it tasted better than it looked in the end. 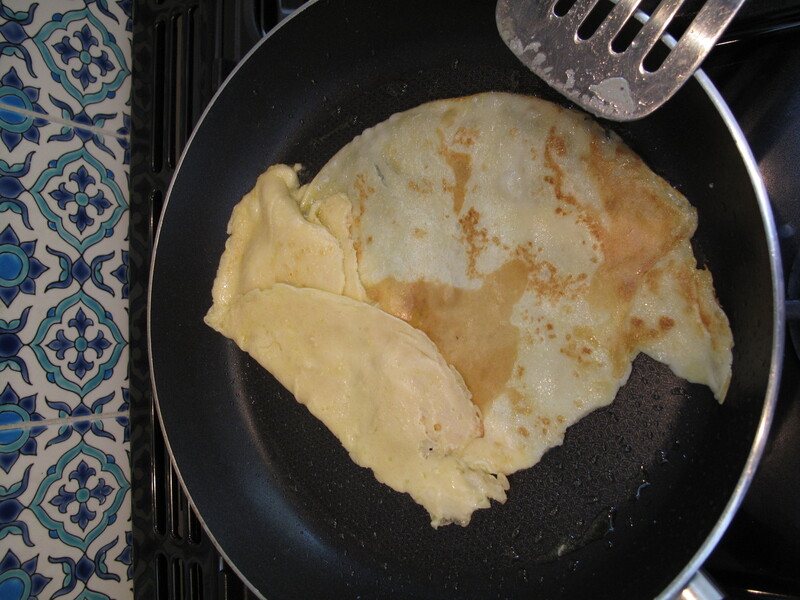 Ha ha ha, it’s not just me who has pancake disasters then… Hilarious. Great story! I love your honesty. The combination sounds like it would be really good. Thanks! I think it would be good if I made it properly with due care and attention. I’d like to try it with the artisan cheese he suggests. Oh dear! But very funny! Sorry! I’ve just discovered your blog and I love it! Love it….sounds just about right…the same happened in my house when I made Stromboli instead of the sacred pizza! Wow – Stromboli does sound ambitious. I am always caught between trying something new that may go wrong and everyone will hate and sticking to the old favourites. I guess it’s good to try something new every now and then. I have just proper full on LOL’d all the way through that! Brilliantly written! I thought the recipe sounded delicious but am now reconsidering that this is something I could create! Thank you! Yes, I think I won’t try so hard in future and all recipes will be proudly displayed in a soggy heap on whatever Gruffalo/Pirate/Peppa Pig combo comes to hand. love it! Cheese pancakes are my fav but I just make pancakes and throw a load of cheese on them – don’t know if I have the patience for that Rick stein recipe lol! I’m not sure I would go to such trouble again (although they were quite nice in the end). Think I’ll still to sugar and lemon and keep everyone fed and happy! Hi, loved your blog, I stumbled across it when my husband watched Rick make this on TV and said he fancied trying it. Despite your hilarious escapades I still want to make it for him but was wondering if I can use frozen spinach? Hi Hannah, thanks for stopping by. Yes, absolutely you could use frozen spinach – thaw it out and drain off as much of the water as you can before you use it (pushing it against a sieve with a spoon often works well). It often says on the packet how much frozen is equivalent to the raw weight. 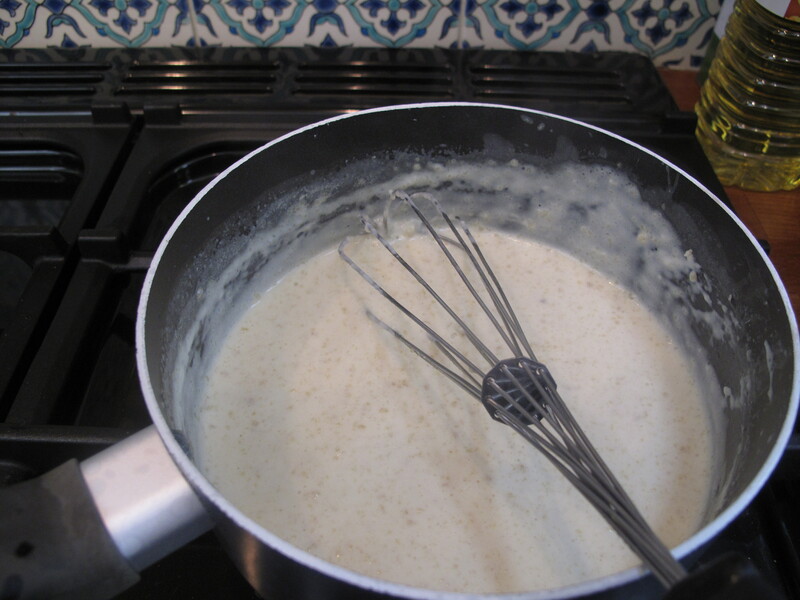 My other top tips would be to make more pancake mix and not use the cheese that I did 😉 Enjoy!